evaluate students’ critical thinking skills. The resulting assessment includes a profile of students’ reasoning abilities that can be effectively used not only as a benchmark against which progress can be measured, but also as a practical guide for critical thinking instruction. Direct License. You may elect to be licensed directly to use the exam. The cost for this is $1000. In this case, you must take responsibility for training the graders and the appropriate use of the exam. With a Training Session For Faculty Graders. You may schedule a training session for faculty to use and grade the test. The cost for this depends on the cost of a workshop in your area of the country. Contact us for professional development workshop information if you are interested in this option. If you schedule this professional training, the test is provided free. Pilot Site. You may elect to become a pilot site for the exam. In this case, you must submit a plan as to how you will field test the exam, specifying what your purpose is and how you will structure your pilot project. To be accepted as a pilot site, you must provide evidence that you will train the graders appropriately and carefully control the conditions under which you pilot the exam. Once you have used the test you must also provide a written report explaining the results of your project. If we accept your plan, the exam will be provided to you free. A preview copy of the test is available below. The purpose of the International Critical Thinking Test is to provide an assessment of the fundamentals of critical thinking that can be used with content from any subject. The goal of the test is two-fold. The first goal is to provide a reasonable way to pre- and post-test students to determine the extent to which they have learned to think critically. The second goal is to provide a test instrument that stimulates the faculty to teach their discipline so as to foster critical thinking in the students. Once faculty become committed to pre- and post-testing their students using the exam, it is natural and desirable for them to emphasize analysis and assessment of thinking in their routine instruction within the subjects they teach. The exam, therefore, is designed to have a significant effect on instruction. The International Critical Thinking test differs from traditional critical thinking tests in that traditional tests tend to have low consequential validity; that is, the nature of the test items is such that faculty, not seeing the relevance of the test to the content they teach, ignore it. The International Critical Thinking Test is the perfect test to teach to. For one, the structure and standards for thought explicit in the test are relevant to thinking in all departments and divisions. The English Department can test their students using a literary prompt. The History Department can choose an excerpt from historical writing; Sociology from sociological writing; etc. In one case, a section from a textbook may be chosen; in another, an editorial, in a third, a professional essay. In short, the writing prompt can be chosen from any discipline or writing sample. What is more, since to make the test reliable the faculty must be intimately involved in the choosing of the writing prompt and in the grading of tests, faculty are primed to follow up on the results. Results are seen to be relevant to assessing instruction within the departments involved. 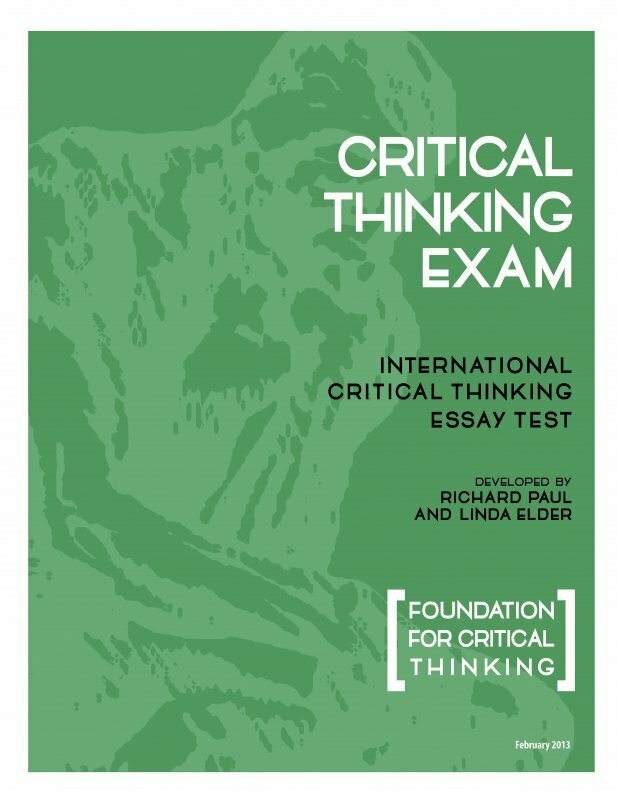 The International Critical Thinking Essay Test is divided into two parts: 1) analysis of a writing prompt, and 2) assessment of the writing prompt. The analysis is worth 80 points; the assessment is worth 20. In the Analysis segment of the test, the student must accurately identify the elements of reasoning within a written piece (each response is worth 10 points). In the Assessment segment of the test, the student must construct a critical analysis and evaluation of the reasoning (in the original piece). Was the student able to effectively evaluate the reasoning, as appropriate, in the original text and present his/her assessment effectively? (Pointing out strengths and possible limitations and/or weaknesses of the reasoning in the writing sample). Pilot Site.You may elect to become a pilot site for the exam. In this case, you must submit a plan as to how you will field test the exam, specifying what your purpose is and how you will structure your pilot project. To be accepted as a pilot site, you must provide evidence that you will train the graders appropriately and carefully control the conditions under which you pilot the exam. Once you have used the test you must also provide a written report explaining the results of your project. If we accept your plan, the exam will be provided to you free. 512M The International Critical Thinking Test $9.95 Qty. The ICAT exam is divided into two parts: 1) analysis of a writing prompt, and 2) assessment of the writing prompt. The analysis is worth 80 points; the assessment is worth 20. In the Analysis segment of the test, the student must accurately identify the elements of reasoning within a written piece (each response is worth 10 points). In the Assessment segment of the test, the student must construct a critical analysis and evaluation of the reasoning (in the original piece). Did the student clearly understand the key components in the thinking of the author, as exhibited in the writing sample? (Identifying Purpose, Question at Issue, Information, Conclusions, Assumptions, Concepts, Implications, Point of View). Was the student able to effectively evaluate the reasoning, as appropriate, in the original text and present his/her assessment (i.e., point out the strengths and possible limitations and/or weaknesses of the reasoning in the writing sample) effectively? In Part I of the test, the grader makes 8 judgments concerning student's work, each worth 10 points. In Part II of the test, the grader grades holistically (0-20 points). There are, therefore, 100 points possible for the two parts: 80 for the first part and 20 for the second part. The graders are asked to keep in mind the following general criteria as they award points. The test taker should be guided by the questions below in developing his/her assessment of the writing sample (Part II). In addition, the test taker is called upon to comment on the reasoning as appropriate in terms of its clarity, accuracy, precision, relevance, depth, breadth, logicalness, significance, and fairness -- or lack thereof. 1. Question: Is the question at issue clear and unbiased? Does the expression of the question do justice to the complexity of the matter at issue? 2. Purpose: Is the purpose well-stated or implied? Is it clear and justifiable? Are the question and purpose directly relevant to each other? 3. Information: Is relevant evidence, experiences and/or information essential to the issue cited? Is the information accurate? Are the complexities of the issue addressed? 4. Ideas (concepts): Are key ideas clarified when necessary? Are the concepts used justifiably? 5. Assumptions: Is there sensitivity to what is being taken for granted or assumed? Are questionable assumptions being used without addressing problems which might be inherent in those assumptions (insofar as those assumptions might reasonably be questioned)? 6. Conclusions: Is a line of reasoning well developed explaining the main conclusions? Are alternative conclusions considered? Are there any apparent inconsistencies in the reasoning? 7. Point of View: Is sensitivity to alternative relevant points of view or lines of reasoning shown? Is consideration given to objections framed from other relevant points of view? If so, were they responded to? 8. Implications: Is sensitivity shown to the implications and consequences of the position taken? Since every administration of the exam requires that a given writing prompt be chosen, it is possible to give students the exam on multiple occasions — in one case, testing their ability to analyze and evaluate scientific thinking; in another, sociological thinking; in a third, literary thinking; and so on. In one case, a section from a textbook may be chosen; in another, an editorial; in a third, a professional essay. In other words, the writing prompt can be chosen from any discipline or writing sample. After you carefully read the writing sample (taking whatever notes you want), you will have two tasks — each of them important. First, you will complete a template (see Form A) demonstrating your ability to recognize key important components in the thinking of an author. For example, demonstrate your ability to recognize the author’s purpose or the nature of the question, problem, or issue that is at the heart of the original editorial, article, or essay. You should not write your answers on Form A. Use your own paper, or blank pages provided, in order to have room to elaborate. Second, you will summarize your assessment of strengths and weaknesses of the reasoning of the original editorial, article, or essay (with special attention to the components you commented on). In doing this, you should present your analysis and assessment in the form of a persuasive explanation of your thinking about the original, imagining your audience as educated reasonable persons. You are therefore appealing to the reason of the audience, not their emotions. You should refer to intellectual standards whenever you can (Clarity, Accuracy, Precision, Relevance, Depth, Breadth, Logicalness, Significance). For example, you might feel that the question or problem in the text was never sufficiently made clear or that the information in support of a key conclusion was irrelevant to the question. You would then state how the issue or question should have been expressed. If you judge that the information in the original editorial, article, or essay was in part irrelevant, you would state what sort of information was relevant and comment on how that information could best be obtained. You should refer to the Criteria for Evaluating Reasoning (see Form B) in assessing the author’s thinking as displayed in the editorial, article, or essay. You are provided with the main criteria that the grader will be using in assessing your answers (see Form C). Did the student clearly understand the key components in the thinking of the original editorial, article, or essay? Was the student able to effectively evaluate the reasoning in the original editorial, article, or essay? Did the student present a reasonable case for his/her interpretation of the writing sample? In an excellent evaluation, the evaluator takes into account the nature and purpose of the original writing sample. For example, it would be inappropriate to apply the same criteria to an editorial (which is severely limited in space) as one would to a research monograph or to a report on a scientific experiment in a scientific journal. In some writing technical information is essential and in other writing it is enough to cite common experience in supporting one’s conclusions. In every case, we expect the student to sympathetically enter into the viewpoint of the author and to engage in a fair-minded assessment based on an insightful understanding of the author’s reasoning. The extra weight (80 points), which is given to an accurate analysis as a necessary first step to evaluation (20 points), reflects our emphasis on the fact that fair-minded critical thinkers always make sure that they understand something BEFORE they criticize it. Good criticism always makes a contribution to the object of its criticism. It brings both strengths and weaknesses out into the open so that we may build on the first and correct the second. What Does Part I Look Like? Directions: After you have carefully read the assigned reading, complete the following sentences with whatever elaboration you think necessary to make your meaning clear. Do not write on the test. Use separate sheets of paper so that you have room for elaboration. 1) The main purpose of this editorial, article, or essay is ________________________. 2) The key question (whether stated or unstated) is __________________. 3) The most important information in this editorial, article, or essay is ____________. 4) The main conclusion(s) in this editorial, article, or essay is (are) ____________________. 5) The main idea(s) we need to understand in order to understand this editorial, article, or essay is (are) ___________________________. Here is a short explanation of what the author means by this/these concept(s): _________________________________________________________________. 6) The main assumption(s) underlying the author’s thinking is (are)________________. 7) The main implication(s) of this line of reasoning is (are) __________. The main purpose of the ICAT test is for internal, not external use. The goal is to facilitate the faculty at given institutions putting more emphasis on thinking critically within the disciplines taught. Because the faculty use various prompts on different testing occasions and choose those prompts from different disciplines, it is difficult to compare student performances (using different prompts) by point scores alone. The goal is for the grading faculty to report back to the teaching faculty with appropriate commentary that enables that teaching faculty to form reasonable conclusions about the degree to which students are developing the critical thinking skills tested by ICAT. The ICAT exam has high "face validity," for it directly tests the students’ ability 1) to accurately identify the most fundamental intellectual structures in thinking, and 2) to do so in a piece of writing which the faculty themselves choose. It is clear and uncontroversial that critical thinking requires the thinker to analyze and evaluate reasoning. The ICAT test requires the student to do just that and, once again, to do so with respect to prompts which are representative of the content that is covered by instruction. One gains insight into the validity of the exam to the extent that one recognizes the significance of the abilities directly tested in the exam: the students’ ability to accurately identify the purpose of a piece of writing, the questions it raises, the information it embodies, the inferences and conclusions arrived at, the key concepts, the underlying assumptions, the implications of the reasoning, and the point of view of the reasoner. One gains further insight into the validity of the exam to the extent that one recognizes the significance of the intellectual standards which the student must use to assess the reasoning in the prompt: the relative clarity, accuracy, precision, relevance, depth, breadth, logicalness, significance, and fairness of the reasoning. Beyond that, one gains insight into the usefulness of the test in grasping its potential in helping faculty to develop comparable descriptions of their programs and course grading standards that highlight the critical thinking embodied in the content. First review some of the basic principles and purposes behind critical thinking so that you go into the grading of the examination with the clearest sense of what you are going to assess. You should review the Elements of Thought and the Universal Intellectual Standards. Then you should carefully review the editorial, article, or essay the students are going to analyze and comment on. Each faculty evaluator should read and take the test himself/herself. Faculty evaluators should reach consensus on the range of interpretations of that piece that are plausible. Once a consensus is achieved, one or two student case analyses should be individually assessed by all faculty and scoring compared. Faculty should use Form A and Form B as the criteria for scoring. All faculty should be within a 10 point range. 1) First, carefully read and analyze the editorial yourself, making sure that you are clear as to its structure: the writer's purpose, the central question posed, the information presented and reasons given in support of the author's position, the main conclusions and concepts, the fundamental assumptions and implications, and, of course, the point of view within the framework of which all of the reasoning proceeds. 2) Do a critical evaluation of the strengths and weaknesses (or limitations) of the original writing prompt. Make sure there is agreement of the faculty graders on these strengths and weaknesses. 2) Read a few of the essays to be scored. 3) Follow the grading procedure detailed in Form C.
4) The margin of error for graders should be plus or minus ten points. Practice grading with two other graders until the scoring of the three of you fall consistently within this range. The first goal is to provide a reasonable way to pre- and post-test students to determine the extent to which they have learned to think critically. The second goal is to provide a test instrument that stimulates the faculty to teach their discipline so as to foster critical thinking in their students. Once faculty become committed to pre- and post-testing their students using the exam, it is natural and desirable for them to emphasize the analysis and assessment of thinking in their routine instruction within the subjects they teach. The exam, therefore, is designed to have a significant effect on instruction. Let's examine this in greater detail. Critical thinking is, among other things, "thinking that analyzes itself, evaluates itself, and improves itself as a result." In science classes, students should learn to think scientifically; in math classes, to think mathematically; in history classes, to think historically; etc. Critical thinking is essential to this internalization. We internalize the logic of scientific thinking when we can analyze, evaluate, and improve instances of it. We internalize the logic of mathematical thinking when we can analyze, evaluate, and improve instances of it. We internalize the logic of historical thinking when we can analyze, evaluate, and improve instances of it. To teach a subject in a critical manner requires that students take ownership of the basic intellectual structures of the discipline (the elements of thought focused upon in Part I of the ICAT exam). It also requires that students internalize intellectual standards which they can use in assessing thinking for its strengths and weaknesses (the standards of thought which are focused upon in Part II of the ICAT exam). To understand content as a mode of thinking, we need to recognize that all content has a logic which is defined by the same eight dimensions that define the thinking which produced and continue to produce it. All content/thinking has been generated by organizing goals and purposes (that enable professionals to share in the pursuit of common ends and projects). All content/thinking is defined by the problems it defines and solves. All content/thinking presupposes the gathering and use of information in professional performance and problem solving. All content/thinking requires the making of inferences from relevant data or information to interpretative conclusions (rendering thereby the data of use to practitioners for guiding judgments). All content/thinking is structured by concepts (theoretical constructs) that organize, shape, and "direct" it. All content/ thinking proceeds from assumptions or presuppositions from which it logically proceeds (providing "boundaries" for the field). All content/thinking generates implications and consequences, that enable professionals to make predictions and test theories, lines of reasoning, and hypotheses. All content/thinking defines a frame of reference or point of view (which provide practitioners with a logical map of use in considering the professional "moves" they will make). Each of the above sentences, as you may have noted, read equally well with either "content" or "thinking" as the subject. This is no accident of language. There is a perfect logical symmetry captured in each case. The symmetry is a reflection of the fact that all of what we call "content" is nothing more nor less than an organized product of a specific mode of disciplined thinking, developed by a community of thinkers. When we master the logic of the thinking, we master the logic of the content. When we master the logic of the content, we master the logic of the thinking. For example, when we learn to think like a historian, we — at one and the same time — master the logic of the discipline called "History." When we master the logic of "History," we master ipso facto, the logic of historical thought. Period. There is nothing else that remains. Once we begin to grasp content as a mode of thinking, we can begin to isolate the connection between what it is that good thinkers must do to think well within that content and what it is that students must do to perform competently in an academic field defined by it. For example, it is possible to construct a generic description of academic goals that can be contextualized for virtually any field of study. Consider the following generic description. As you read through it, mentally place your discipline in the blank spaces. It is followed by a couple of sample contextualizations to exemplify what we mean. Students successfully completing a major in ___ will acquire a range of ___ thinking skills and abilities which they use in the acquisition of knowledge. Their work at the end of the program will be clear, precise, and well-reasoned. They will demonstrate in their thinking command of the key ___ terms and distinctions, and the ability to identify and solve fundamental ___ problems. Their work will demonstrate a mind in charge of its own ___ ideas, assumptions, inferences, and intellectual processes. They will demonstrate the ability to analyze ___ questions and issues clearly and precisely, formulate ___ information accurately, distinguish the relevant from irrelevant, recognize key questionable ___ assumptions, use key ___ concepts effectively, use ___ language in keeping with established professional usage, identify relevant competing ___ points of view, and reason carefully from clearly stated ___ premises, as well as show sensitivity to important ___ implications and consequences. They will demonstrate excellent ___ reasoning and problem-solving. Students successfully completing a major in History will demonstrate a range of historical thinking skills and abilities which they use in the acquisition of knowledge. Their work at the end of the program will be clear, precise, and well-reasoned. They will demonstrate in their thinking command of the key historical terms and distinctions, and the ability to identify and solve fundamental historical problems. Their work will demonstrate a mind in charge of its own historical ideas, assumptions, inferences, and intellectual processes. They will demonstrate the ability to analyze historical questions and issues clearly and precisely, formulate historical information accurately, distinguish the relevant from irrelevant, recognize key questionable historical assumptions, use key historical concepts effectively, use historical language in keeping with established professional usage, identify relevant competing historical points of view, and reason carefully from clearly stated historical premises, as well as show sensitivity to important historical implications and consequences. They will demonstrate excellent historical reasoning and problem-solving. Students successfully completing a major in Anthropology will demonstrate a range of anthropological thinking skills and abilities which they use in the acquisition of anthropological knowledge. Their work at the end of the program will be clear, precise, and well-reasoned. They will demonstrate in their thinking command of the key anthropological terms and distinctions, and the ability to identify and solve fundamental anthropological problems. Their work will demonstrate a mind in charge of its own anthropological ideas, assumptions, inferences, and intellectual processes. They will demonstrate the ability to analyze anthropological questions and issues clearly and precisely, formulate anthropological information accurately, distinguish the relevant from irrelevant, recognize key questionable anthropological assumptions, use key anthropological concepts effectively, use anthropological language in keeping with established professional usage, identify relevant competing anthropological points of view, and reason carefully from clearly stated anthropological premises, as well as show sensitivity to important anthropological implications and consequences. They will demonstrate excellent anthropological reasoning and problem-solving. Students successfully completing a major in Biology will demonstrate a range of biological thinking skills and abilities which they use in the acquisition of biological knowledge. Their work at the end of the program will be clear, precise, and well-reasoned. They will demonstrate in their thinking command of the key biological terms and distinctions, and the ability to identify and solve fundamental biological problems. Their work will demonstrate a mind in charge of its own biological ideas, assumptions, inferences, and intellectual processes. They will demonstrate the ability to analyze biological questions and issues clearly and precisely, formulate biological information accurately, distinguish the relevant from irrelevant, recognize key questionable biological assumptions, use key biological concepts effectively, use biological language in keeping with established professional usage, identify relevant competing biological points of view, and reason carefully from clearly stated biological premises, as well as show sensitivity to important biological implications and consequences. They will demonstrate excellent biological reasoning and problem-solving. Students successfully completing a major in Philosophy will demonstrate a range of philosophical thinking skills and abilities. Their work at the end of the program will be clear, precise, and well-reasoned. They will demonstrate in their thinking command of the key philosophical terms and distinctions, and the ability to identify and solve fundamental philosophical problems. Their work will demonstrate a mind in charge of its own philosophical ideas, assumptions, inferences, and intellectual processes. They will demonstrate the ability to analyze philosophical questions and issues clearly and precisely, formulate philosophical information accurately, distinguish the relevant from irrelevant, recognize key questionable philosophical assumptions, use key philosophical concepts effectively, use philosophical language in keeping with established professional usage, identify relevant competing philosophical points of view, and reason carefully from clearly stated philosophical premises, as well as show sensitivity to important philosophical implications and consequences. They will demonstrate excellent philosophical reasoning and problem-solving. Students successfully completing a major in Marketing will demonstrate a range of marketing thinking skills and abilities which they use in the acquisition of knowledge. Their work at the end of the program will be clear, precise, and well-reasoned. They will demonstrate in their thinking command of the key marketing terms and distinctions, and the ability to identify and solve fundamental marketing problems. Their work will demonstrate a mind in charge of its own marketing ideas, assumptions, inferences, and intellectual processes. They will demonstrate the ability to analyze marketing questions and issues clearly and precisely, formulate marketing information accurately, distinguish the relevant from irrelevant, recognize key questionable marketing assumptions, use key marketing concepts effectively, use marketing language in keeping with established professional usage, identify relevant competing marketing points of view, and reason carefully from clearly stated marketing premises, as well as show sensitivity to important marketing implications and consequences. They will demonstrate excellent marketing reasoning and problem-solving. Students successfully completing a major in Mathematics will demonstrate a range of mathematical thinking skills and abilities. Their work at the end of the program will be clear, precise, and well-reasoned. They will demonstrate in their thinking command of the key mathematical terms and distinctions, and the ability to identify and solve fundamental mathematical problems. Their work will demonstrate a mind in charge of its own mathematical ideas, assumptions, inferences, and intellectual processes. They will demonstrate the ability to analyze mathematical questions and issues clearly and precisely, formulate mathematical information accurately, distinguish the relevant from irrelevant, recognize key questionable mathematical assumptions, use key mathematical concepts effectively, use mathematical language in keeping with established professional usage, identify relevant competing mathematical points of view, and reason carefully from clearly stated mathematical premises, as well as sensitivity to important mathematical implications and consequences. They will demonstrate excellent mathematical reasoning and problem-solving. Students successfully completing a major in Nursing will demonstrate a range of nursing thinking skills and abilities which they use in the acquisition of knowledge in nursing. Their work at the end of the program will be clear, precise, and well-reasoned. They will demonstrate in their thinking command of the key nursing terms and distinctions, and the ability to identify and solve fundamental nursing problems. Their work will demonstrate a mind in charge of its own nursing ideas, assumptions, inferences, and intellectual processes. They will demonstrate the ability to analyze nursing questions and issues clearly and precisely, formulate nursing information accurately, distinguish the relevant from irrelevant, recognize key questionable nursing assumptions, use key nursing concepts effectively, use nursing language in keeping with established professional usage, identify relevant competing nursing points of view, and reason carefully from clearly stated nursing premises, as well as show sensitivity to important nursing implications and consequences. They will demonstrate excellent nursing reasoning and problem-solving. Students successfully completing a major in Management will demonstrate a range of management thinking skills and abilities. Their work at the end of the program will be clear, precise, and well-reasoned. They will demonstrate in their thinking command of the key management terms and distinctions, and the ability to identify and solve fundamental management problems. Their work will demonstrate a mind in charge of its own ideas, assumptions, inferences, and intellectual processes in management. They will demonstrate the ability to analyze management questions and issues clearly and precisely, formulate information accurately, distinguish the relevant from irrelevant, recognize key questionable management assumptions, use key management concepts effectively, use management language in keeping with established professional usage, identify relevant competing management points of view, and reason carefully from clearly stated premises, as well as show sensitivity to important management implications and consequences. They will demonstrate excellent management reasoning and problem-solving. Students successfully completing a major in Music will demonstrate a range of musical thinking skills and abilities. Their work at the end of the program will be clear, precise, and well-reasoned and well-performed. They will demonstrate in their musical thinking and performance command of the key musical terms and distinctions, and the ability to identify and solve fundamental musical problems. Their work will demonstrate a mind in charge of its own musical ideas, assumptions, inferences, and intellectual processes, as well as musical performance. They will demonstrate the ability to analyze musical questions and issues clearly and precisely, formulate musical information accurately, distinguish the relevant from irrelevant, recognize key questionable musical assumptions, use key musical concepts effectively, use musical language in keeping with established professional usage, identify relevant competing musical points of view, and reason carefully from clearly stated musical premises, as well as show sensitivity to important musical implications and consequences. They will demonstrate excellent musical reasoning, problem-solving, and performance. Students successfully completing a major in Human Ecology will demonstrate a range of ecological thinking skills and abilities which they use in the acquisition of ecological knowledge. Their work at the end of the program will be clear, precise, and well-reasoned. They will demonstrate in their thinking command of the key ecological terms and distinctions, and the ability to identify and solve fundamental ecological problems. Their work will demonstrate a mind in charge of its own ecological ideas, assumptions, inferences, and intellectual processes. They will demonstrate the ability to analyze ecological questions and issues clearly and precisely, formulate ecological information accurately, distinguish the relevant from irrelevant, recognize key questionable ecological assumptions, use key ecological concepts effectively, use ecological language in keeping with established professional usage, identify relevant competing ecological points of view, and reason carefully from clearly stated ecological premises, as well as show sensitivity to important ecological implications and consequences. They will demonstrate excellent ecological reasoning and problem-solving. Students successfully completing a major in Physical Education will demonstrate a range of physically-based thinking skills and abilities. Their work at the end of the program will be clear, precise, well-reasoned and well-performed. They will demonstrate in their thinking and performance command of the key physical and sport terms and distinctions, and the ability to identify and solve fundamental problems inherent in physical education and performance. Their work will demonstrate a mind in charge of its own ideas, assumptions, inferences, and intellectual processes as they are integral to physical performance. They will demonstrate the ability to analyze questions and issues clearly and precisely, formulate information accurately, distinguish the relevant from irrelevant, recognize key questionable assumptions, use key concepts effectively, use physical education language in keeping with established professional usage, identify relevant competing points of view in physical education, and reason carefully from clearly stated premises, as well as show sensitivity to important implications and consequences. They will demonstrate excellent reasoning, problem-solving, and performance in a variety of domains of physical education. The ICAT Critical Thinking Essay Examination highlights basic structures in thought and basic intellectual standards. Those structures and standards can be combined to create generic academic performance standards. One possible effect of the adoption of the exam is greater alignment between critical thinking and criteria for grades in courses. The text below defines the outlines of potential standards for the "grades" of A, B, C, D, and F. These specifications of performance levels are suggestive of common denominator academic values (tested by the ICAT exam). These specifications must, of course, be contextualized at two levels: at the department level (to capture domain-specific variations) and at the course level (to capture course-specific differences). The grade of A implies excellence in thinking and performance within the domain of a subject and course, along with the development of a range of knowledge acquired through the exercise of thinking skills and abilities. A-level work is, on the whole, not only clear, precise, and well-reasoned, but insightful as well. Basic terms and distinctions are learned at a level which implies insight into basic concepts and principles. The A-level student has internalized the basic intellectual standards appropriate to the assessment of his/her own work in a subject and demonstrates insight into self-evaluation. The A-level student often raises important questions and issues, analyzes key questions and problems clearly and precisely, recognizes key questionable assumptions, clarifies key concepts effectively, uses language in keeping with educated usage, frequently identifies relevant competing points of view, and demonstrates a commitment to reason carefully from clearly stated premises in the subject, as well as marked sensitivity to important implications and consequences. A-level work displays excellent reasoning and problem-solving within a field and works consistently at a high level of intellectual excellence. The grade of B implies sound thinking and performance within the domain of a subject and course, along with the development of a range of knowledge acquired through the exercise of thinking skills and abilities. B-level work is, on the whole, clear, precise, and well-reasoned, but does not have depth of insight. Basic terms and distinctions are learned at a level which implies comprehension of basic concepts and principles. The B-level student has internalized some of the basic intellectual standards appropriate to the assessment of his/her own work in a subject and demonstrates competence in self-evaluation. The B-level student often raises questions and issues, analyzes questions and problems clearly and precisely, recognizes some questionable assumptions, clarifies key concepts competently, typically uses language in keeping with educated usage, sometimes identifies relevant competing points of view, and demonstrates the beginnings of a commitment to reason carefully from clearly stated premises in a subject, as well as some sensitivity to important implications and consequences. B-level work displays sound reasoning and problem-solving within a field and works consistently at a competent level of intellectual performance. The grade of C implies mixed thinking and performance within the domain of a subject and course, along with some development of a range of knowledge acquired through the exercise of thinking skills and abilities. C-level work is inconsistently clear, precise, and well-reasoned; moreover, it does not display depth of insight or even consistent competence. Basic terms and distinctions are learned at a level which implies the beginnings of, but inconsistent comprehension of, basic concepts and principles. The C-level student has internalized a few of the basic intellectual standards appropriate to the assessment of his/her own work in a subject, but demonstrates inconsistency in self-evaluation. The C-level student sometimes raises questions and issues, sometimes analyzes questions and problems clearly and precisely, recognizes some questionable assumptions, clarifies some concepts competently, inconsistently uses language in keeping with educated usage, sometimes identifies relevant competing points of view, but does not demonstrate a clear commitment to reason carefully from clearly stated premises in a subject, nor is he/she consistent in sensitivity to important implications and consequences. C-level work displays inconsistent reasoning and problem-solving within a field and works, at best, at a competent level of intellectual performance. The grade of D implies poor thinking and performance within the domain of a subject and course. On the whole, the student tries to get through the course by means of rote recall, attempting to acquire knowledge by memorization rather than through comprehension and understanding. The student is not developing critical thinking skills and understandings as requisite to understanding course content. D-level work represents thinking that is typically unclear, imprecise, and poorly reasoned. The student is achieving competence only on the lowest order of performance. Basic terms and distinctions are often incorrectly used and reflect a superficial or mistaken comprehension of basic concepts and principles. The D-level student has not internalized the basic intellectual standards appropriate to the assessment of his/her own work in a subject and does poorly in self-evaluation. The D-level student rarely raises questions and issues, superficially analyzes questions and problems, does not recognize his/her assumptions, only partially clarifies concepts, rarely uses language in keeping with educated usage, rarely identifies relevant competing points of view, and shows no understanding of the importance of a commitment to reason carefully from clearly stated premises in a subject. The D-level student is insensitive to important implications and consequences. D-level work displays poor reasoning and problem-solving within a field and works, at best, at a low level of intellectual performance. The student tries to get through the course by means of rote recall, attempting to acquire knowledge by memorization rather than through comprehension and understanding. The student is not developing critical thinking skills and understandings as requisite to understanding course content. F-level work represents thinking that is regularly unclear, imprecise, and poorly reasoned. The student is not achieving competence in his/her academic work. Basic terms and distinctions are regularly incorrectly used and reflect a mistaken comprehension of basic concepts and principles. The F-level student has not internalized the basic intellectual standards appropriate to the assessment of his/her own work in a subject and regularly mis-evaluates his/her own work. The F-level student does not raise questions or issues, does not analyze questions and problems, does not recognize his/her assumptions, does not clarify concepts, does not use language in keeping with educated usage, confuses his/her point of view with the TRUTH, and shows no understanding of the importance of a commitment to reason carefully from clearly stated premises in a subject. The F-level student is oblivious of important implications and consequences. F-level work displays incompetent reasoning and problem-solving within a field and displays consistently poor intellectual performance. Education is a high word. It is not socialization. It is not training. It is not indoctrination. It is the internalization of the life of reason within a domain of purposes and problems. It is the cultivation of a variety of modes of thought. It is the development of the power of knowledge. We are educated only when we are able to think within multiple fields and have the ability to learn to think in others. It would be odd to say that a person was well educated but not able to figure out the purposes, the questions, the information, the key concepts, the point of view, and so forth, of their own thinking and that of others. In a like manner, it would be odd to say of persons that they reasoned well, except for their tendency to be unclear, inaccurate, imprecise, irrelevant, superficial, narrow-minded, illogical, trivial, and unfair. The ICAT Critical Thinking Essay Exam focuses on what is the substantive core of education.